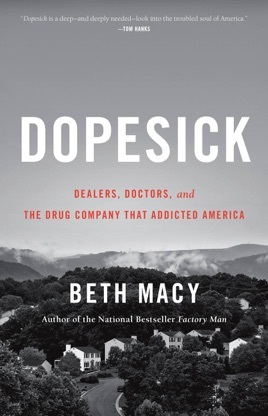 Dopesick sheds much-needed light on a shocking reality, going beyond headlines to examine the horrific toll of opioid addiction across America. Chronicling the two decades following the introduction of OxyContin in 1996, investigative reporter Beth Macy shows how the drug’s overprescription ended up fueling the current epidemic of heroin abuse. Macy lets addicts tell their own stories, and gives a platform to those who have lost children, parents, spouses, and friends to addiction. She also examines the story from the other side, interviewing doctors, pharmaceutical executives, and street dealers, revealing the complexities of the issue. Journalist Macy (Truevine) takes a hard and heartbreaking look at the cradle of the opioid addiction crisis, the Appalachian region of Virginia and nearby states. She places the responsibility for the epidemic squarely on Purdue Frederick, makers of OxyContin, and its sales division, Purdue Pharma, which engaged in near-predatory marketing practices to sell a drug that has wreaked havoc on the lives of 2.6 million Americans who are currently addicted, with more than 100 dying per day from opioid overdoses. In the first of three sections, she addresses "big pharma" in telling detail, outlining how the overprescribing of pain medication in doctors' offices and emergency rooms created a market demand that was then met by illegal drug peddlers on the streets. Section two follows the spiral of addiction as users of prescription pills no longer able to afford their habit turn to heroin, a cheaper and more lethal solution to feed their fix. 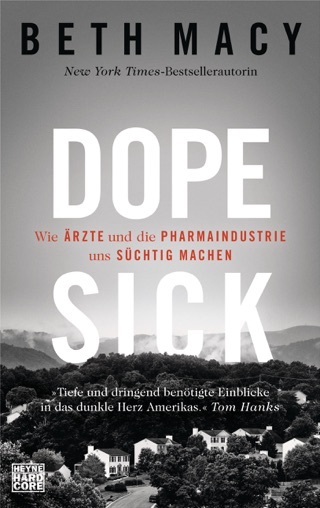 In the last section, the author changes the focus to what has become an addiction treatment industry. 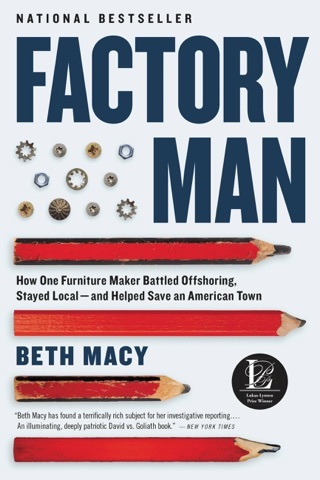 Macy potently mixes statistics and hard data with tragic stories of individual sufferers, as well as those who love and attempt to treat them. One addict, Tess Henry, was just 26 when she was first interviewed by Macy and, despite multiple attempts at rehab so that she could raise her infant son, she was dead within three years. Macy's forceful and comprehensive overview makes clear the scale and complexity of America's opioid crisis. The current fad to attack the prescribing of opiates and benzodiazepines completely ignores the fact that people must have relief from chronic pain and anxiety as well as the fact there are no substitutes for these medications. Addiction is the least of worries of people that cannot live with the terrible pain and panic attacks these drugs reduce. It’s the current fad to prevent trained professionals from prescribing what they know is keeping their patients alive and in some cases functional. Go attack the sale of proven killers that continue to cause many more deaths in a completely uncaring way such as alcohol, and tobacco products. Don’t torture to death your loved ones. Get the facts. The WHO has easy to use databases and tools to access them that will show that deaths due to misuse of these medications is the issue. Stop the root of the problem, misuse and addictive excess use. Do some research and you will find there are zero substitutes for treating severe systemic pain. There are medications that are much worse such as the ones pain clinics are experimenting with that have been in existence for years but never released for sale because of ineffectiveness or they have not been able to pass FDA approval and are completely experimental, available directly from clinics that have concocted them. Most all people have no conception of what life with crippling pain or panic attacks are like. Neither does this author. Try and imaging anxiety so severe that you feel you are suffocating. They don’t call it the fight or flight response for nothing. Perhaps the author needs a heavy dose of epinephrine or for pain, a broken back or bone spurs stimulating their peripheral nerves. There is nothing short of cancer, severe arthritis, complicated by ulceration of the stomach and colon to replicate the pain so many feel. There is no empathy here, just a way to ride the current fad of ignoring facts and expert advice for cash. Talk to people that are suffering like this instead of jumping on the insurance company propaganda wagon. Since 2016, more than 50 medications have been dropped from policies, not for safety concerns but because it’s not profitable to assist paying for coverage of medications that may be needed for the rest of the insured’s life. Think for a change. The current administration in Washington has along with the Republican majority in Congress have been trying to enrich the already rich further by siding with big business. Check out medical insurance and you will find, like most forms of insurance, that just two or three corporations sell coverage to smaller insurance companies. Anti-monopoly (a small number of companies dominating an entire segment of business) and anti-trust (price fixing) laws are no longer being enforced in order to make the political big contributors more willing to fund million and now billionaire politicians. The only time you will be even addressed by these crooks is at election time. You are not represented, you were dismissed for funding. Excellent! 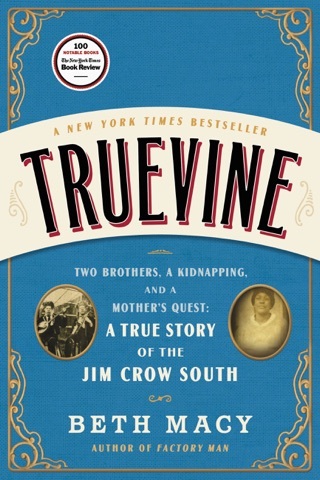 Every parent, politician, doctor, teacher should read this!